Our customers frequently ask us if we can help them apply dynamic text overlays over images. While a common approach is to add text elements in your pages using HTML elements, CSS or native mobile UI controls, in many cases it's preferable to create images with text layers already included. It makes it simpler to display rich content on different media channels and devices, while ensuring a pixel-perfect result as your graphic designer envisioned. Text overlays on images can be used to embed a caption, a photographer's name or a watermark for copyright reasons. It can also be used to embed dynamic images in emails that have limited visual customization capabilities, dynamic building of advertisement banners with variable content, dynamic creation of print materials (e.g., coupons, greeting cards, business cards) and more. Cloudinary's cloud-based media management service allows you to upload, specify a given text, and dynamically overlay it over your images and videos. Cloudinary does the image and video processing on the fly, and returns a new image which includes the required text layer. We've already shown in previous posts how you can create text layers using authenticated API calls and use text layers to build dynamic banners. You can now use Cloudinary's image manipulation URLs to add text layers to images on-the-fly, while selecting any font out of a set of hundreds of fonts. You can also further customize and manipulate your text layers to achieve the desired look and feel. All this is done in the cloud using dynamic URLs (no authenticated API calls are required). Cloudinary's dynamic manipulation URL allows you to add a text overlay while specifying the font, the actual text content, and customizing the look and feel. For example, the following dynamic URL added the label 'Sea Shell' as an overlay on a previously-uploaded image named sea_shell.jpg. The component that starts with l_text: is followed by the font name and size and then the actual 'Sea Shell' label. The overlay is positioned 20 pixels from the top of the containing image by setting the gravity parameter to north (or g_north in the URL). In this example, we added a label using the Arial font of size 60 pixels. You can click on the tabs in the example above to see how to build this dynamic manipulation URL using Cloudinary's client libraries for Ruby on Rails, Python & Django, PHP, Node.js, Java and .Net. Cloudinary supports hundreds of fonts, include all Google’s Web Fonts. You can specify the name of the font in manipulation URLs (case insensitive). In addition, you can specify any standard font customization by appending one or more of the following directives: bold, italic, underline, strikethrough, center, left, right. The color of the text overlay can be selected to match your graphic design by setting the color manipulation parameter (or co for URLs) to a color name or an RGB representation. 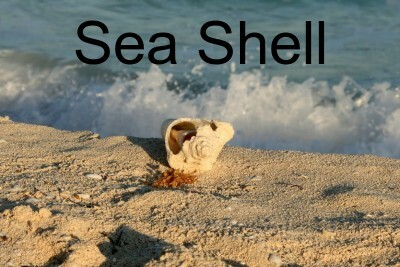 The example below added the ‘Sea Shell’ label colored blue and this time using the bold Helvetica font of size 80 pixels. 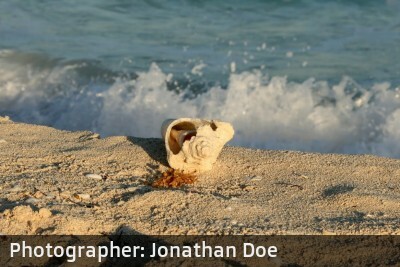 One of the common examples of text overlay is to add a caption with photo description and credits. The example above added an overlay with a credit to the photographer. This time we used the Doppio font while adding a semi transparent black overlay at the bottom of the photo, underlying the white text. You may want to embed a longer text in your generated images. If so, you’ll need the text to be automatically wrapped into lines. You’ll also want to control the alignment of your text. 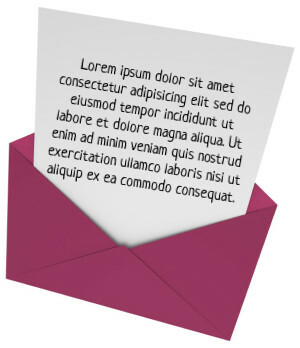 As you can see in the example below, a long text was overlaid over a previously uploaded image named ‘envelope.jpg’. The dynamic text layer is automatically wrapped and also aligned to the center. We specified the fit crop mode and defined a maximum width of 200 pixels, which tells Cloudinary to automatically wrap the actual text content. In addition, we rotated the generated text layer 9 degrees, to better fit in the background image (using the angle parameter, or a in the manipulation URL sample). This time we used the Neucha font, size 16 pixels, with center alignment. All examples above added a single text overlay. You can use Cloudinary’s manipulation URLs to chain multiple overlays, generating a resulting image that is delivered optimized via a CDN to your users. Cloudinary’s client libraries can be used to build chained transformation URLs with multiple text overlays. You can also directly build these URLs by separating the different components with /. The following example used the same background envelope.jpg image. This time adding 3 different text overlays. Each text overlay uses a different set of font family, font size, color and positioning. The result is quite cool and professional, isn’t it? 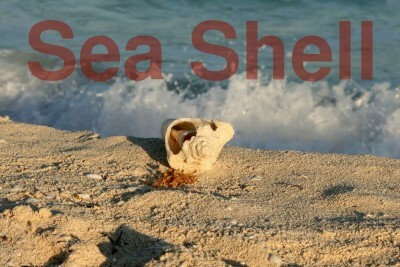 As we already know from many of our customers, adding text overlays to images and photos is useful for many use cases. The addition of dynamic text styles and content that you can use, as an on-the-fly manipulation of images uploaded to Cloudinary, makes the process much simpler and more dynamic. The resulting images can be embedded in your website, mobile application or marketing emails, while ensuring that your users see it exactly as designed without any browser or device-specific customization. Text overlay URLs with dynamic styles, as well as client library support for generating these URLs using Ruby on Rails, Python & Django, PHP, Node.js, Java and .Net, is available of all Cloudinary plans, including the free plan. If you don’t have an account yet, get a free account and try it out for yourself. We’d also love to hear your feedback on this feature in the comments below, or via Facebook or Twitter.